The Art and History of William Wendt [1865-1946] an early California Impressionist artist! 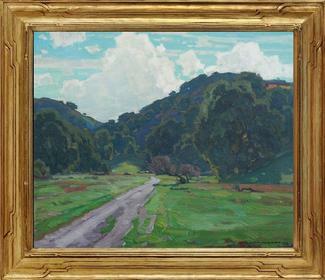 Buying & Selling Fine William Wendt Paintings! The William Wendt Gallery is devoted to the art and history of William Wendt (1865-1946) an early California Impressionist painter. 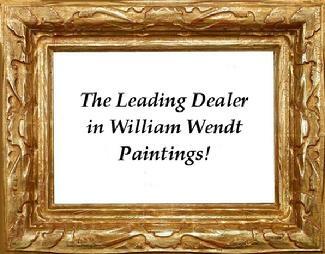 We are buyers and sellers of fine William Wendt paintings! On this site you will find a William Wendt biography, historical information & helpful links that we hope you enjoy and find useful. If you are interested in purchasing William Wendt paintings, you may wish to add your name to our mailing list to be notified of new availabilities! Our Commitment is to help preserve the vanishing treasures of William Wendt's art for the benefit of present & future generations of collectors, museums, scholars, students and art lovers. 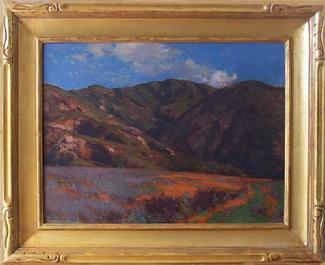 In that regard we can be your resource tool for the research, evaluation, conservation, framing and care of your valuable painting...and, if you wish to sell we can find a good home for your painting, many of our buyers are always interested in knowing about new William Wendt paintings in the marketplace. William Wendt ~ Field with Poppy and Lupine Flowers ~ 18 x 24 inches, oil on canvas! William Wendt "The Green Earth"